Giraffes start running with the herd the same day they are born, but humans can take a year or more just to start walking. The answer is economic. After a two-metre drop from its standing mother, a newborn giraffe will get up and begin to walk in a matter of minutes. Later that day it will start running. It takes roughly two years for humans to do the same. While some animals are born to hit the ground running, others don’t even have training wheels and enter the world completely reliant on their parents. Marsupials, including kangaroos, are born as embryos no bigger than a kidney bean and unable to survive on their own. Why this striking difference in the development of newborn mammals? According to Professor Mark Elgar, an evolutionary biologist in the School of BioSciences at the University of Melbourne, it is all driven by a kind of evolutionary economics. Like the law of diminishing returns, despite all the love in the world there is only so much a parent can do to ensure its offspring survives to reproduce. This law, first applied to economics, simply means that there is a declining return on investment from any additional investment. At some point animal mothers must step back to focus on producing a new offspring, and their current offspring must go it alone. Precisely when this happens depends on the trade-off between the mother’s need to nourish and protect the young, while also nourishing and caring for herself. While her offspring would love being looked after for as long as possible, it would eventually take away time and resources that the mother could to put towards her recovery and preparing for future pregnancies. 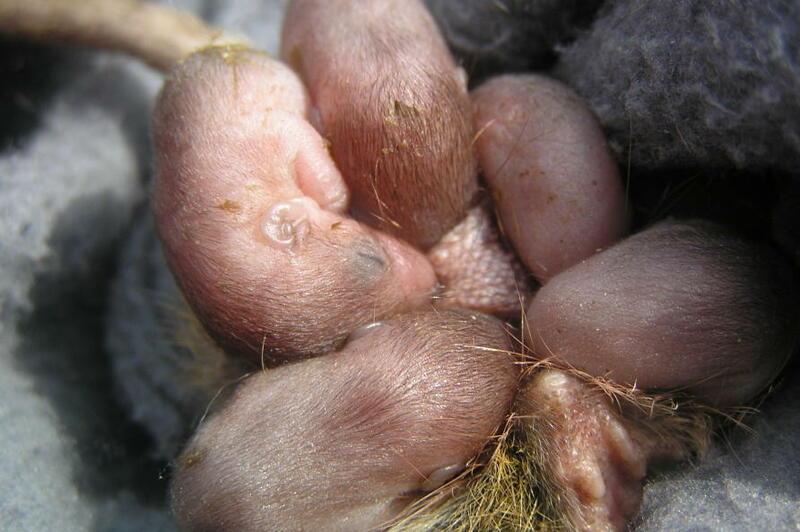 Mouse-like antechinus marsupials suckling: Picture: Michael Sale/Flickr. Professor Elgar says that early on when offspring are most vulnerable “it’s really important that she gives her offspring lots and lots of resources…but at some point any additional investment in current offspring isn’t actually going to have a major impact on the survival of those offspring”. Professor Elgar says trade-offs between the number of offspring being born, the manner in which mothers find food, and their capacity to protect and feed their offspring, dictate how much care is invested to develop their young. 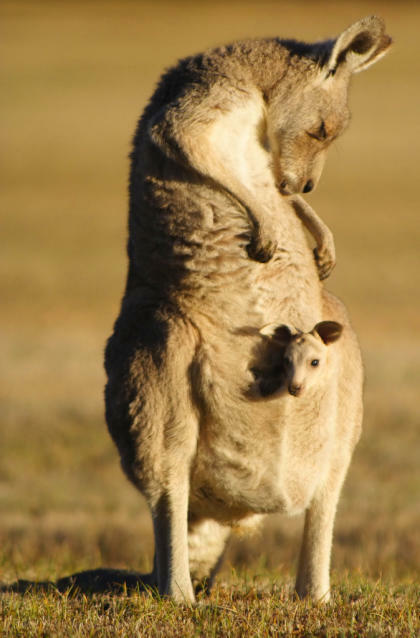 Kangaroo joeys are so underdeveloped at birth that they don’t start leaving the pouch until about six months, and then they keep jumping back in until permanently kicked out. Picture: Robert Parviainen/Flickr. Generally the more developed an offspring is at birth, the higher the chance of its survival. But while it might be safer to develop inside the mother for as long as possible, the mother’s anatomy and physical capacity to carry offspring limits this. If many of an animal’s offspring perish, then it will need to adapt to increase the litter size.But that will further restrict how big the offspring can develop in the womb. Giraffes are born precocial. 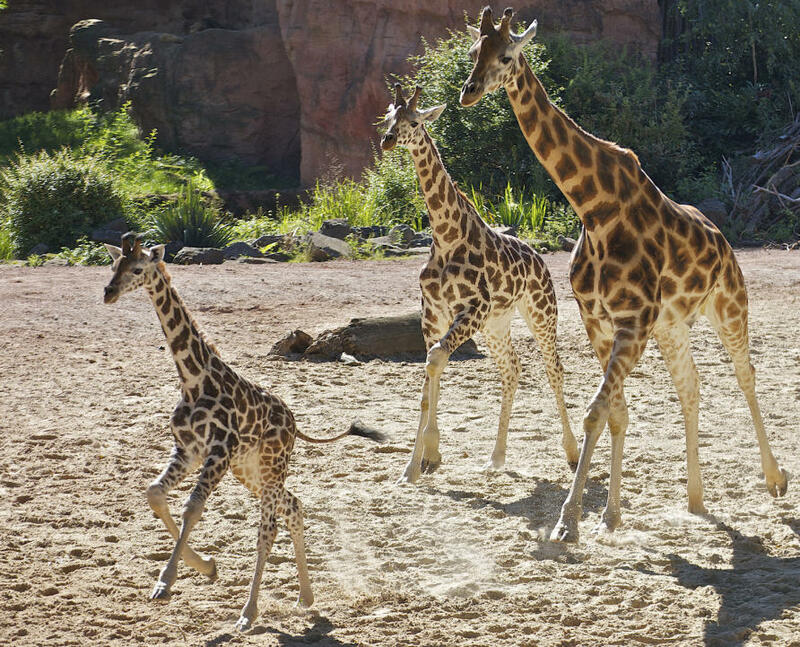 This means that newborn giraffes emerge relatively well developed, sighted and sufficiently mobile to run with its herd. At the other extreme, kangaroo joeys are born altricial. Like humans, they are born underdeveloped and defenceless, fully reliant on their mother for everything. Professor Elgar says that regardless of whether an animal is precocial or altricial “after birth, the mother is going to be providing most of the nutrients…although for precocial species it may be that the offspring will start supplementing that diet reasonably quickly”. It also depends entirely on the diet. If you have to go out and catch it, the offspring will depend on its mother for much longer. Lionesses, for example, hunt for their food. To stalk and capture a buffalo is a complex task better suited to the strong, quick and agile. Trying to hunt while heavily pregnant, or worse, having cubs getting in the way isn’t going to end well. 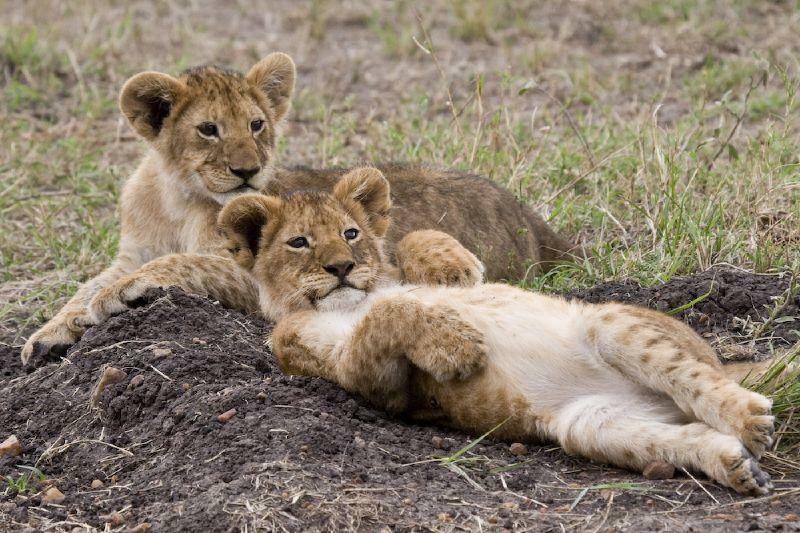 Lion cubs are pretty useless at birth but can be left alone in the den while mum goes and hunts. Picture: Brian Scott/Flickr. So lionesses have evolved to give birth to small, altricial young who although blind and defenceless can be left in a den, typically with other young cubs, for short periods in between nursing. Mammals that graze have to travel far to maintain a continuous food supply. Consequently, newborn giraffes need to be born mobile to keep up with mum so they can be nursed. “Large herbivores might range over a very large area, too far in fact in a particular day to make it worth returning to an original site,” Professor Elgar explains. Human parents today may no longer be constrained by the trade-offs between current and future reproduction – more easily exhausting their capacity to provide for their children. But eventually, like animals, there comes a time where supporting your children living at home starts to take on a different kind of toll. Banner Image: Jessica Lee O/Flickr. Are Australians hooked on middle class welfare and nanny state regulation or is government the key to fairness?